In a large bowl combine flour, salt, eggs. Stir in sufficient water to make a soft dough and make Spaetzle according to basic recipe. Allow Spaetzle to cool a little before adding the salad ingredients. Mix mayonnaise, dressing, gherkin juice and Maggi seasoning together. 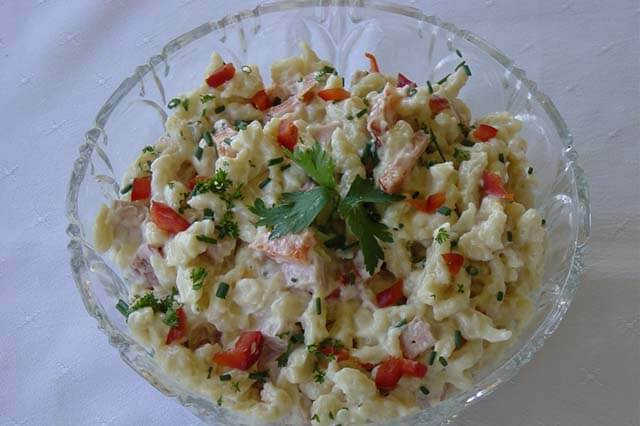 Then fold through spaetzle with diced salad ingredients and the chicken/ham. Gently mix all together and let salad stand 1 hour for flavours to combine. While some of the above ingredients can be substituted, Whole Egg mayonnaise and Keens Mustard powder are crucial to the final flavour.